Only Molteni finshed the 1972 Giro with their team intact. Merckx was at the top of his game in the 1972 Giro. He attacked with many kilometers to go in the seventh stage and took the lead. From there, his superb time-trialing and climbing left the others fighting for scraps. José-Manuel Fuente put up a brave and relentless fight, but no one was going to beat Merckx in 1972. Franco Bitossi, Miguel-Maria Lasa, Michele Dancelli, Dino Zandegù, Kurt Rub, Ludo van Stayen, Georges Pintens, Albert van Vlierberghe, Eddy Merckx @ s.t. Franco Bitossi, Gianni Motta, Albert van Vlierberghe, Miguel-Maria Lasa, Georges Pintens, Felice Gimondi, Davide Boifava, Michele Dancelli @ s.t. All Riders are Italian unless otherwise noted. Eddy Merckx returned to contest the 1972 Giro. He was the reigning World Road Champion and the winner of the previous year’s Tour. Giro director Vincenzo Torriani designed a mountainous race hoping to keep the man nicknamed the “Cannibal” from eating the rest of the competition alive. The 100-man start list of riders would have to try to figure out some way to deal with the Merckx menace. This group included Gösta Pettersson, Italo Zilioli, Roger de Vlaeminck, Motta, Bitossi, Fuente and Gimondi. La Gazzetta thought de Vlaeminck, winner of that spring’s Paris–Roubaix as well as the week-long Tirreno–Adriatico stage race, might be able to give Merckx a real challenge. Merckx would find plenty of trouble in this Giro, but it would come from elsewhere. The man who holds the record for Giro participations (eighteen starts and sixteen finishes) almost didn’t start the 1972 Giro: super climber Wladimiro Panizza was without a team until Zonca signed him at the last minute. The Giro organizers had long wanted a Venice stage with the riders finishing in front of St. Mark’s Cathedral. The Venetians had continually rebuffed plans for the riders to cross the canals over a series of temporary wooden bridges. In 1972 the city relented and agreed to the proposal, but at the last minute Venice changed its mind and the prologue was cancelled. Several other cities offered to host the prologue, but Torriani wanted his Venetian start. He did the best he could with a bad situation and had the riders attend mass in Venice’s St. Mark’s. Since he was the 1971 winner, Gösta Pettersson was awarded the Pink Jersey to start the next day’s stage and the prize money that had been held for the prologue was distributed among the 100 riders. The first stage left from Mestre, the mainland city across the lagoon from Venice, and traveled to Ravenna, onetime capital of the Roman Empire. The Giro settled into its normal rhythm of a piano pace in the stage’s early kilometers. As the race got closer to the finish, the speed increased until the final 20 kilometers were nearly non-stop attacks. It came together for a bunch sprint with Marino Basso winning the stage and taking the lead. This year time bonuses weren’t in play so the field was credited with same time as Basso. The next day ended just inland from the Adriatic in Fermo, a hilltop city in Le Marche. The mild climb to the finish caused a selection that resulted in a sprint of champions. Gianni Motta won it from Bitossi, who was having gear troubles. Basso was third, followed by Merckx and de Vlaeminck. Basso kept his leadership in both points and the Overall. The hilly third stage, still taking the riders through Le Marche, sparkled with hard attacks. Fuente, probably testing Merckx’s legs, jumped away on a climb, only to have Merckx easily mark him and then counter-attack, forcing Fuente to dig deep. The finish showed why Franco Bitossi had the reputation of being one of cycling’s finest tacticians. After another series of blistering attacks, the peloton regrouped, a time when the pack can become lazy while the riders hope for a chance to recuperate. Bitossi sent his teammate Ugo Colombo on a flier. Colombo made it stick, beating the Merckx-led pack by 15 seconds and becoming the new maglia rosa. Now came the much anticipated stage four’s 48-kilometer morning half-stage with its hilltop finish at Block Haus. It was here in 1967 that Merckx had sent shock waves through the cycling world when he dropped Adorni, Zilioli, Anquetil and Gimondi in his first Giro. The climbing started just before the little town of Pretoro, the pack splitting almost immediately. Fuente’s KAS team began probing and sending men up the road. Merckx didn’t take the bait, knowing that it was Fuente he had to watch. With fifteen kilometers left, Fuente rolled the dice and off he went, leaving Merckx protected by only one teammate and surrounded by six good-climbing KAS riders. The Giro continued to head straight for the toe of the Italian boot as Fuente held his lead. The biggest animator of the next few stages was Bitossi, who kept trying to escape. He came close several times, but was always hunted down and caught. Stage seven went through the rugged Sila Mountains of Calabria. While Fuente and the KAS team spent the time before the stage’s start signing autographs, the Molteni squad did a hard warm-up. Merckx took off from the gun. Most of the peloton thought that with 151 difficult kilometers ahead, the Belgian was committing suicide. Fuente and his KAS teammate Santiago Lazcano were the only riders with Merckx after the first climb and they suffered horribly in the process. Over the top of Monte Scuro, Merckx descended like a fiend. The Spaniards, not having Merckx’s downhill skills, had to let him go. Pettersson, who had been staying reasonably close to the trio, took terrible chances and managed to close the gap to Merckx on the descent. Fuente tried to bridge up to Merckx and Pettersson but gave up and waited for the bunch. Merckx let Pettersson take the stage and the field came in 4 minutes 13 seconds later. The Giro crossed the Strait of Messina for a Sicilian stage that made no change to the General Classification. The riders were given a rest day and transferred to Rome to head up the western side of the peninsula. It wasn’t unusual for the Spanish riders of the 1970s and ’80s to sit in the back of the field during the piano sections of the race, but it is a tactic fraught with danger, and regularly the Iberians were caught napping. It happened to them during stage ten, going from Rome to Monte Argentario/Porto San Stefano. There was an intermediate sprint mid-way through the stage that caused a split in the pack. The Spaniards were forced to chase the Merckx-led front group, making contact just in time for the beginning of the climb up Monte Argentario. Italo Zilioli got away near the top and held his slender 15-second lead into Porto San Stefano. Stage eleven, 242 kilometers up to Forte dei Marmi on the Tuscan coast, was a combative day with the Spaniards yet again playing catch-up. When Merckx saw Fuente wasn’t near the front, he launched an attack. Merckx always tried to keep speeds high on the flat and rolling stages, feeling this caused the smaller climbers—whom he believed had lesser energy reserves—to suffer and arrive at the mountains exhausted. Fuente was able to bridge, but during the closing kilometers he was hit with even more bad luck. His tire developed a slow leak as the speeds had been whipped up, forcing him to ride the last fifteen kilometers on a low tire. He didn’t dare stop to change his wheel and possibly never re-join the pack. The ferocity of the racing in stage eleven had been a surprise, since a 40-kilometer time trial was the next day’s race. Again Torriani showed his creativity. Instead of a single 40-kilometer run, the day had two 20-kilometer races spaced a couple of hours apart. Merckx won the first one with his teammate Roger Swerts and Gimondi 11 seconds behind. Swerts turned the tables on the second ride, beating Merckx by 11 seconds. The judges awarded the overall stage to Merckx, who was 26/100 of a second faster. Stage fourteen featured two climbs, Sestriere and a mountain new to the Giro, the Jafferau, topped by the town of Bardonecchia. As the climb to Sestriere started to bite, the Spaniards started to dish out some pain to the slow-moving peloton. Almost instantly a front group of fourteen containing most of the big names (but missing Bitossi and de Vlaeminck) formed. After three attacks, Fuente managed to extract himself from this group and meet up with two teammates who were already off the front, López-Carril and Galdós. López-Carril was unable to withstand the pace and soon dropped off. Merckx, who had met Fuente’s first two attacks, decided to climb at his own pace and let Fuente go. Fuente crested the Sestriere climb with a 50-second lead on Merckx’s nine-man group. This was a slim lead, but Fuente and Galdós pressed on into the valley where they found themselves fighting a headwind. Still, they arrived at the base of the Jafferau climb with a lead of about one minute on Merckx, who had waited for help. Merckx’s group was now 28 men strong. Once the climbing started, Galdós ran out of gas and Fuente was on his own. With four kilometers remaining of the ever-steepening climb he still had 1 minute 5 seconds. It wasn’t enough. Merckx was on fire and as Fuente cracked in the final kilometer, Merckx steamed right on by. Panizza, the last man to come off Merckx’s wheel, also went by the Spaniard. Fuente said he had given everything, but Merckx had twice his strength. Merckx replied that Fuente was even stronger than Luis Ocaña. High praise indeed, Ocaña being the only rider who really challenged Merckx in stage races when the Belgian was at his peak. Trusting that the Giro management would want to keep the stars in the race, several of the most famous riders blatantly hung onto cars or let themselves get pushed up the Jafferau. Their fame was an insufficient defense and Motta, Bitossi, Zilioli, Willy De Geest and Giovanni Varini were thrown out of the Giro. The day’s cheating was so widespread that most of the others still left in the race were given some form of penalty. The teams threatened to quit if the riders weren’t reinstated, but the race jury stood its ground and the teams stayed in. The denouement of the Giro was at hand. Stage sixteen took the riders over two hard passes, the Foscagno and the Eira. The day’s drama was supplied in a water bottle filled at a roadside stream by one of Merckx’s gregari. As the racers began the Foscagno, Merckx began to suffer abdominal pains, thought to have been caused by the unclean water in his bottle. Fuente attacked and was able to extract a slim lead that Merckx was able to erase on the descent. 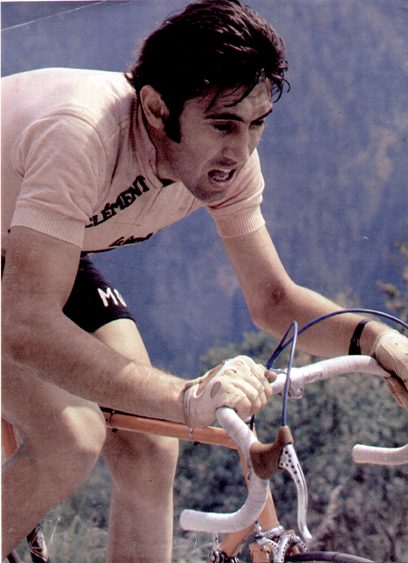 Merckx turned the day into another triumph when he came into Livigno 63 seconds ahead of the feisty Spaniard. The next day was the Giro’s Cima Coppi (a Giro’s highest point), the Stelvio. The ascent was to be up the famous northern, or Trafoi side. 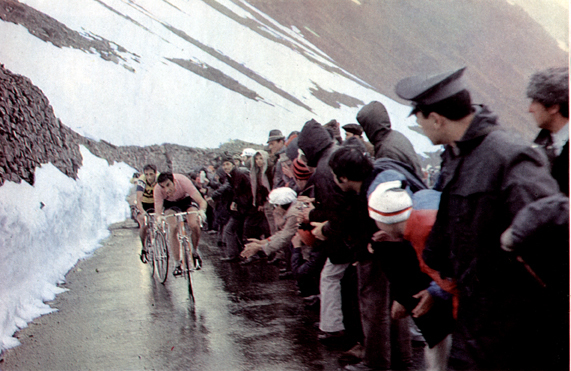 Twelve kilometers from the summit Fuente launched his second attack and not even Merckx could resist. Fuente ascended the Stelvio using a mind-boggling 54 x 18 gear. It’s said that only Coppi had been able to use such a huge gear on the Stelvio. Fuente nearly cooked himself, slowing near the top as he passed between walls of snow. He crossed the finish line at the top of the Stelvio 32 seconds ahead of his teammate Galdós and 2 minutes 5 seconds ahead of Merckx and Panizza. Merckx was still the Pink Jersey. 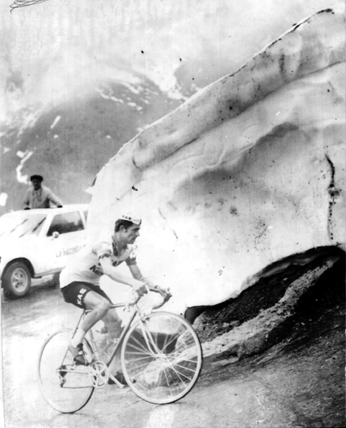 José-Manuel Fuente on the Stelvio. He's in the small ring here. Merckx chases Fuente, but can't close the gap. That was it. Fuente had thrown everything he could at Merckx every time the road rose to the sky. It was never enough. There were still two stages with climbing, but the contest was over. Merckx won the penultimate stage, an 18-kilometer time trial, extending his final lead over Fuente to more than five minutes. While Torriani had been denied his dream of a Venetian prologue, he was finally granted another wish, a finish in front of Milan’s giant white gingerbread cathedral, won by Paolini. For the first time, the best-placed Italian rider was a lowly fifth. Merckx’s Molteni team was the only squad to finish intact. That made three Giro victories for Merckx. Showing how far cycling and the Giro had fallen, Italian television had dispensed entirely with live broadcasts of the Giro stages and was showing only highlights in the evening.